Upon This Foundation: Are new church designs taking us backward? In recent years, this view has taken physical form in church architecture. Not only has dissatisfaction with the status quo grown. But anticipation of changes to the texts and texture of parish liturgical prayer has also spawned a revival of traditional-looking churches to replace the ubiquitous, Modernist structures of the previous half-century. Perhaps the same impulse within the church that has caused such changes in ritual practice as the decanting of the blood of Christ from “cup” to “chalice”—both literally and in the revised translation of the Roman Missal—is also behind the return to traditional architecture. Armed with Pope Benedict XVI’s Christmas address to the Roman Curia in 2005, these proponents of the change (the neo-traditionalists) argue that the strictly forward-looking or Modernist architecture prevalent since the council embodies a “hermeneutic of discontinuity and rupture” that is inimical to the church’s role as conservator of sacred memory. Fortunately, the neo-traditionalists stop short of proposing a one-size-fits-all program for converting the physical environment of the liturgy back into a former version of itself. This point is best illustrated by two examples, the first a modification of the conciliar model, the second a departure from it. The goal of parishioners at St. Michael Church in Wheaton, Ill., soon after a fire in 2002, was to erect a new, more symbolically potent structure they hoped would be “unmistakable as a Catholic church.” Aided by Ruck/Pate Architects of Barrington, Ill., and a construction budget as lofty as its aspirations, the parish succeeded in creating a structure (2006) that weds the principles of sound liturgical theology to its a desire for something nobler than the typical “drywall church.” The design preserves the assembly’s essential unity and participatory character, the various modes and stations of Christ’s appearance in ritual and the latent presence of baptism in every sacramental action. In plan, the major worship setting is familiar, a fan-shaped space ringed by areas for devotional and social activities. A large immersion font on axis with the altar dominates the setting’s entrance bay, not far from twin reconciliation chapels. The building is distinguished by the manner in which the upper registers of its enclosing shell have been made to mimic the effect of a longitudinal space terminating in a half-domed apse—like those churches with which Catholic architectural history is replete. To this have been added stenciled truss-work and finish detailing in multicolored wood and marble that lend the interior volume a measure of luxury. The building’s exterior features brick and cast-stone facing materials that hearken back to an era of masonry churches marked by permanence. Its ecclesiastical identity is amplified by a Gothic-style window and door surrounds and by an imposing bell tower. Similar details characterize the external form of St. John Neumann Church in Farragut, Tenn., (2008), pictured above right, inspired by the Romanesque churches of Normandy. 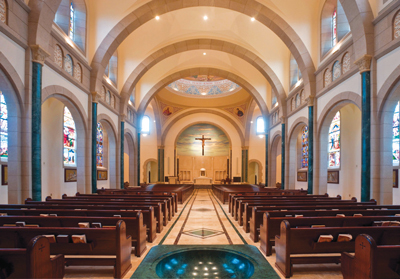 From the hardy stone masses of its major body parts to the terracotta tiling of its roofs, St. John’s embodies the qualities of rootedness, strength and durability, which its architects (Cram & Ferguson Architects of Concord, Mass.) and client-parish impute to Catholic Christianity itself. More striking than the building’s sheer monumentality, perhaps, is its cruciform plan—a spatial configuration largely absent from liturgical design since Vatican II because of its fracturing effect on the assembly. Here, however, the attenuated expanse of the building’s nave and the strict delineation of precincts for lay and clerical function seem consistent with the overall goal of formality. The interior presentation is enhanced by a full complement of stained glass windows and masonry finishes and by the kind of freestanding and applied sculpture likely to remind some older visitors of the churches of their youth. As if to accentuate its departure from standardized models of postconciliar church-building, the design of St. John situates musicians in an old-fashioned choir loft at the rear of the nave, as opposed to a site more integrated with the assembly seating. The design makes no provision for the baptism of adults by immersion. It also breaks with the widespread practice of placing the tabernacle somewhere other than at the heart of the sanctuary, the rules for which are clearly outlined in “Built of Living Stones” (2000), the U.S. Conference of Catholic Bishops’ directive on church architecture. In St. John Neumann Church, the reserved Blessed Sacrament is afforded optimum visibility behind the altar, where it is doubly tented beneath the domes of a metal tabernacle and marble ciborium. Whether buildings like these are compromises, aberrations or the first fruits of a full-blown “movement” in American Catholic church design is still uncertain. Yet church architecture always raises the question, What is a church? Is it a temple in which God lives? A tent within which a pilgrim people assembles? Or many other things? And what does a post-Vatican II Catholic church look like if the answer is “both” or a variant of “all of the above”? View a slideshow of new traditional churches. The major change implicated by the conciliar form was aural/acoustical, not so much visual. For centuries, architects of Catholic churchs could create vast spaces with a gauzy nimbus of an acoustic, because the servers in the sanctuary and, at solemn masses, a schola, did all the reciting/singing work of the people in the pews, and important parts of the celebrant's prayers did not need to be heard. THE rise of the preaching orders during the High Middle Ages and then the Tridentine reforms revived architectural designs where at least homilies/sermons would be audible, but still, there's was lots of room for gigantism. The less that is said of the carpeted multi-function room approach that took hold (starting before Vatican II), the better. The conciliar reforms imply that new church buildings need to be designed to have natural acoustics that support and encourage the participation by the people in both recited and sung dialogues and in the other parts of the ordinary and, if feasible, propers. This argues against both gigantism and carpeted minimalism. Relying on sound systems to do the heaviest lifting (especially regarding anything sung) that the architecture should itself do is not good practice. The aural dimensions of a church design are as important as its visual dimensions. A church building that does not sound and sing properly is, for all of the glories of its visual design, a poorly designed building. Yuck. Sorry, but I find the photos of the new "traditional" churches to be depressingly dark and box-y. Contrast them to the artistic work of William Schickel, who redesigned the Church at the Abby of Gethsemane. So much more honesty, simplicity and clarity. I once heard an interesting comment, "Space defines behavior." If one wants Catholics to actively participate at Mass, then the space has to be arranged so that people feel a sense of gathering. You don't get that feeling while seated silently in straight pews. Can't someone think beyond brick and mortar? My all-time favorite neo-traddie concoction is Ave Maria University's oratory in the shape of a bishop's MITRE! Those who long for so-called traditional looking worship buildings are still thinking of church as structure rather than as people. Post Vatican II churches reflected the ecclesiology and liturgiology inspired by Lumen Gentium and Sacrosanctum Conciliae. They were arranged so that the worshippers could be as close as possible to the altar and Ambo. Their dimensions took into consideration the God who dwells in our midst more than the God who soars above us. These are places where God's priestly people can be led in worship by ministerial priests who don't Lord it over them but serve them. I've been a concelebrant at St. peter's with thousands of people in attendance and found it an awesome experience but far prefer my much smaller parish church and it's intimacy. I can't get get the slideshow to work on my iPad, it's me isn't it? Anyhow, needless to say, I am appalled. About what, I'm not sure as the pictures above look quite nice to me, but I'll find something! Here is a beautiful little chapel in Dublin belonging to the Red Nuns which I found very serene and friendly. I found the cells on Skellig Michael quite damp. I don't know what the monks were thinking there! The difficulty with the Schickel designs is that the Council called for noble simplicity in liturgy and art, not industrial austerity. There's virtually nothing identifiably Christian, let alone Catholic, about Schickel's abbey. I can't agree with using a broad label of “neo-traditionalist” for the quite diverse array of examples of sacred art that we see discussed in and accompanying your essay. What we see in here really falls into two quite distinct categories. Firstly, there are those designs, like St. Michael, which really are just buffed up postmodernist, attempting the occasional quotation of traditional idioms while being regrettably illiterate in them, presenting only a vague memory of a lost tradition. Secondly, however, there are those which can reasonably carry a label with the word “traditionalist” in it, such as St. John Neumann or Duncan Stroik’s renovation of St. Mary’s in Norwalk. These latter typically are not just mindless recreations of past styles, but have a real literacy in these idioms, and a decent idea of how they fit harmoniously together. The examples in the photo gallery very clearly fit into one or the other category. That reflects what I’m seeing out there on the ground today. And, unfortunately, the former vastly outweigh the latter. Chances are, in fact, that the typical suburban parish church being built today is some kind of postmodern design. The planning committes seem to realize that the pew sitters are craving something more traditional, and end up commissioning designs which incoherently grasp toward that, slapping on a bell tower here, some arches and columns there. Either way, I think these two design idioms have to be treated separately, even if they may be responding to some of the same impulses. And as for those impulses, they do seem to embody your quite accurate observation: "But to renew or reinvent itself, the church did not need to erase all physical traces of its past." If only this principle could have been received much sooner. The Trappist Cistercian community that is served by the Abbey Church at Gethsemani bears a history, intentionality and discipline that is so very different from that of a parish church. As beautifully austere as the "barn" style is, I could not imagine a neighborhood parish using it as well as a community of monks with origins dating back to St. Benedict. Not every church has to be a Gothic or Romanesque (or even Byzantine) replica. But the industrial plainness of the Vosko, Inc. era has left so much to be desired in how it shapes the liturgical/catechetical life of a community. Churches indeed need to "speak" to people, regardless of their education or state of life. Big-box churches don't always do that (But I might be biased. I attend here: http://bit.ly/MkHH0M ). And the altar rail provides a perfect division between the class of clergy and the great unwashed, uncared for laity. Jesus wept! When I visited Schickel's Abbey in Louisville, I was rather shocked at what I saw. The space was austere, barren, cold, and one could not identify it as Catholic at all. This is Modernism at its worst. The Abbey church needs an infusion of a 1,000 bright and colorful icons, otherwise this could be a Unitarian church or a Baptist assembly hall. Erasing Catholic identity is troublesome. The Orthodox have managed to resist this form of self-destruction. Our Lady of the Angels in Los Angeles is another example of a Modernist travesty. Here again we have the church as assembly hall or VFW meeting space. While touring a number of Roman Catholic churches in Vienna recently, I was struck by the haphazard clash of styles: magnificent Romanesque-Gothic high altars, richly appointed with frescoes and images, with an oddly shaped table plunked down in front like something dropped from The Planet of the Apes: the oh-so-simple Vatican II altar table (aka Julia Child’s table). In such historic environments, the table, however expertly crafted, looks fairly comical. While the elaborate iconography in these splendid old churches makes Julia Child’s table seem less intrusive or offensive, that’s not the case in many new Catholic churches built since the close of Vatican II—a Council called by Pope John XXIII in 1962 to renew and invigorate the Church. Vatican II unleashed a virtual windstorm that not only affected how Catholics worship (less smells and bells, more utilitarian-style services), but the buildings they worship in. That windstorm produced a fair amount of architectural self-destruction. According to Michael Rose, author of ‘Ugly as Sin: Why They Changed Our Churches from Sacred Places to Meeting Spaces—and How We Can Change Them Back Again,” the catalyst for the change was a duplicitous 1978 draft statement by the U.S. Bishop’s Committee on Liturgy, entitled ‘Environment and Art in Catholic Worship.’ Rose asserts that this document was “cunningly published in the name of the National Conference of Catholic Bishops, implying approval from Rome.” But the Vatican II document, Sacrosanctum Concilium, which was cited in the draft statement as the reason for the ‘wreck-o-vation,’ did not call for the wholesale slaughter of traditional Catholic church architecture. The U.S. Bishops apparently had another agenda: the reshaping of Catholic churches into more relevant, people-oriented worship spaces. This meant plain wooden altar tables rather than marble high altars with images of saints and angels; carpeted rooms; plain glass stained windows; potted plants in place of traditional Catholic artwork; small and nondescript Stations of the Cross that disappear into the walls; churches in the round resembling MTV soundstages; the elimination of altar rails and sanctuary lamps. Crucifixes replaced by Baptist-style wooden crosses or geometric plus signs; the traditional baptismal transformed into a hot tub. Older churches, including many cathedrals, were stripped bare as high altars were removed and dismantled, and historic frescoes and icons whitewashed. In the end, the new churches and “renovated” cathedrals had the look of conference halls or inter denominational chapels. Hundreds, maybe thousands of churches worldwide were destroyed by the architectural iconoclasts. But like every fad or fashion of the moment, the cold, Spartan “new” church look eventually ran its course. After 40 years of sacred bareness, the Catholic art and architecture community has finally come around to assessing the damage. Stroik, who teaches classical architecture at Notre Dame, says he first began noticing a problem in Catholic Church architecture about 20 years ago. “While there was a movement in the USA and the world for a return to tradition in architecture, the Catholic Church seemed behind the times. At the time I was reflecting on that, and thought, ‘Wow, other types of buildings are being revived in the traditional or classical way, but not so much the churches.’ So I started to teach that kind of architecture, and I started to practice it. I’ve seen a lot of other architects pursue the same thing in the last 20 years. The idea that a modernist thrust stage must be built for the altar area is a problem when it comes to tradition, Stroik says. “They feel very vacuous, but a lot of pastors and liturgists have bought into the idea that you need more of a thrust stage for the altar,” he said. The thrust stage, of course, is more of an entertainment-style concept, or the liturgy as show. The thrust stage in many parishes has become a magnet for choir chairs (a choir should be in the back of the church, Stroik believes) musical instruments and sound stage equipment, elements that transform “Julia Child’s table,” —unlike the marble high altar of old- into jut another piece of functional furniture in a secularized space. New Hope’s Saint Martin of Tours church had its interior renovated along the lines of the post Vatican II ‘conference hall’ church. It replaced an older (traditional) interior unchanged since the church was dedicated in 1885. In Philadelphia’s Fishtown neighborhood, Holy Name of Jesus Parish at 701 E. Gaul Street had its church wrecked by a Dominican friar between the years 1971 and 1973. Officially founded in February 1905 in a three-story building on Frankford Avenue, ground was broken for the present day church in the fall of 1921. Holy Name’s architectural makeover in the 1970s was the brainchild of Father Edward L. Martin, O.P., who felt that many of the traditional trappings had to go. Like so many other pastors around the country, the good priest was a victim of the “simplifying” frenzy that followed the Council. “They cut off the principal altar, the high altar. They put in a butcher block in the center of the church and a crucifix hanging from the ceiling. The Dominicans also took the whole altar rail out. The sanctuary was carpeted. This kind of carpeting buckles over time, so it was pretty much a mess in 1998 when a new pastor took over,” Holy Name pastor Father Francis P. Groarke told me by telephone. The Dominicans, thankfully, did not remove the church’s side altars, and left the old wooden statues in place, a generous move considering the fate of other churches, where side altars wound up in piles on various city trash heaps. Also left untouched were devotional shrines to the Infant of Prague and Saint Jude. “When the Dominicans left in 1998, they took everything, even the silverware,” Father Groarke joked. Vatican II did not issue any edicts calling for the removal of church altar rails. What happened is that in many American churches this was done more or less by design consensus when communion-in-hand became a popular from of receiving the sacrament. The altar rail, traditionally, is the western version of the Eastern iconostasis (a screen of icons that frames the altar). In many modern Catholic churches today there’s no delineation of the sanctuary: an altar rail used to signify that one was entering a place of special reverence. Today, with the reform of the (Vatican II) reform in full swing, side altars and altar rails are back in style, especially since Pope Benedict’s Summorum Pontificum, which makes it easier for parishes to celebrate the Traditional Latin Mass (TLM). With the TLM, where communion in hand would not be acceptable, there would have to be an altar rail of some sort. The priest would also need to face the tabernacle, not the people, so side altars—which have not been converted into tables- would be a necessity. But even ‘bare bones’ spaces like Daylesford Abbey, as much as they resemble bank vaults or gymnasiums, can be aesthetically and devotionally rescued by adding a few icons. One of the saddest stories of post Vatican II church destruction has been the saga of St. Leo’s in the Tacony section of Philadelphia. But the ugliest thing of all was the new altar, something that parishioners referred to as a horseshoe shaped ironing board. “The church went from being a meeting hall to a cathedral in a couple of months,” he said. The happy event coincided with the parish’s 150th anniversary.” Fr. Seeney’s still has his eyes set on a large traditional sanctuary lamp he’d like to put that in place of the minimalist ‘stand alone’ pole that’s in the church today. But the iconoclasts, if anything, were thorough. They even whitewashed St. Leo’s colorful ceiling frescos and murals. “My goal is to repaint them,” Father Seeney said. Who knows what the “experts” were thinking when they ransacked and destroyed so many scared spaces. One thing’s certain: the tide has turned, and change is coming. Architectural taste is personal, of course. I recently went with my wife and a friend to a local "modern" church that I found horrific but the two women loved. Part of the difference in opinion was due to the criteria of judgement: they were looking at it liturgically; to me, it was just a piece of bad architecture - monstrous and excessively cold. To them, it worked symbolically. Many of the churches built before the last fifty years were, I suppose, architectural imposters - built to look like Medieval cathedrals but in fact made of steel, plaster and concrete. They did, however, benefit from the beautiful architectural spaces of the original design. Churches built more recently, it seems to me, have generally been architectural failures, bland and dull at best. Liturgically, they're probably fine. I wouldn't know. Certainly, tradition and continuity are good, especially when you're dealing with a tradition of a thousand years or more. Unless you've decided to turn your back on everything the past represented and accomplished, I can't imagine a good reason for throwing it all away. Impressive. I like it better on the inside than on the outside, though. Michael DeSanctis is on to something. There is evidence prompted in part by the new Roman Missal, that church buildings lately are being renovated and built new to house a liturgical practice that, in my opinion, resonates less with the pastoral instruction in the Constitution on the Sacred Liturgy - "Liturgical services are not private functions but celebrations of the church which is the sacrament of unity namely a holy people united and organized under their bishops" (CSL 26). Humbly I refer readers to my article in America (November 3, 2003) where I explored how the ecclesiology of the congregation (diocese?) will shape the liturgy practiced in church and cathedral buildings. To paraphrase an old axiom, "we shape our places of worship and they will shape our prayer." I wish Michael had drawn some conclusions in his otherwise well written survey. This article also appeared in print, under the headline "Upon This Foundation," in the May 28, 2012 issue.